“I’ve run out of superlatives,” Oliver said today. The landscape is so continuously varied and marvelous we seem to be in a state of awe-overload. Yesterday on the Ring Road from Skriðuklaustur in the East to Mývatn in the North, we stopped at the turn off to Askja Way – a fateful moment in The Tricking of Freya. 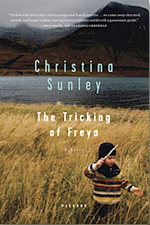 Again, I had the sense I had at Thingvellir – that I was experiencing the memories of my characters rather than my own. Not only is it forbidden to drive a rental car on the road to Askja, but the signs here say that even off-road jeeps are banned. In my novel, Freya’s Aunt Birdie takes her on a wild and dangerous jeep ride to the volcano Askja – for those who haven’t read the book I won’t say anymore than that. Personally, I feel my own fate is also tied to Askja – if Askja had not erupted in 1875, my grandfather’s family would probably never have left Iceland. The flat-topped mountain Herðubreid, on the way to Askja. This roadside map shows the route Birdie and Freya take in the novel, starting south from the Ring Road on F88 and ending up at Askja’s crater Víti. An arctic fox hunting an arctic tern. ...and fumaroles just off the Ring Road. Are we still on earth? So beautiful pictures and it looks like a wonderful trip. You are really lucky with the weahter, it is not standard having a sunny 2 weeks trip! Hrefna, I feel amost guilty! It is nothing like I told Oliver it would be. Today was the first day it wasn´t sunny. It was a relief to have some ´real´Icelandic weather!